A Legacy gift is a great way to support Niagara Hospice. By making a legacy gift to Niagara Hospice, you are assuring that your generosity and support will be long remembered by others in the community and, more importantly, by the patients and families we serve. Legacy gifts can be made in any dollar amount or nearly any type of property. These types of gifts usually require the assistance of a development professional and a knowledgeable adviser to facilitate making the gift due to their more complex nature. Niagara Hospice is a member of the Western New York Chapter of Leave A Legacy, a collaborative association that helps local nonprofit agencies grow their Legacy Giving programs to sustain their mission and expand services for the future. A sample of the language you could use in a bequest by will or revocable trust: "I give, devise, and bequeath to Niagara Hospice, tax identification number 22-2524016, 4675 Sunset Dr., Lockport, NY 14094 (nature of gift, whether percentage amount, specific item, or remainder of estate) for its unrestricted use and purpose." 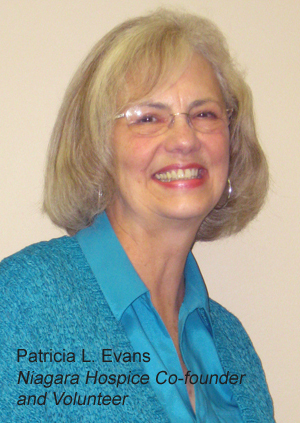 In addition to the possible tax benefits and satisfaction you receive in helping sustain a wonderful cause, individuals who intend to make a Legacy Gift have the option of becoming members of the Patricia L. Evans Legacy Society. If you have any questions about Legacy Gifts or would like to notify us of your intention to become a member of the Patricia L. Evans Legacy Society, please contact our development office at (716) 280-0780 or e-mail us at info@niagarahospice.org. Our staff will help you define your legacy and answer any questions you may have. The Patricia L. Evans Legacy Society is named after Niagara Hospice's friend and co-founder in appreciation for her leadership and vision in helping make Niagara Hospice the great organization it is today. In 1980, Pat Evans recognized the need to help Niagara County residents diagnosed with a terminal illness. Pat and a core group of volunteers established Niagara Hospice in 1988 when the organization served its first home care patient. Even back then, Pat had a vision for a place to go for hospice care for individuals who have no caregiver system at home. That vision became a reality when Niagara Hospice House opened its doors and accepted its first patient in June 2007. Pat's pride and overwhelming joy showed as she spoke at the opening ceremony. Although a humble servant for Niagara Hospice, many recognize that without the vision of Patricia Evans there might still be a pebble on the ground waiting for that special someone to pick it up and see so much more.